ProArgi-9 Plus Recommendation From Sherilyn! Addressing the One Critical Factor That Makes ALL the Difference for Enhanced Strength Training! In Part 1 of Strength Training we discovered how little attention is paid to the health of your endothelial cells and their importance to athletic performance. It doesn’t surprise me because most physicians and health care professionals don’t even talk about this subject with their patients. Yet this organ called the endothelium and all its endothelial cells play a critical role in the health of your cardiovascular system. Every component of athletic performance centers on the health of your endothelial cells and their ability to properly produce nitric oxide, the master signaling molecule of the cardiovascular system. In Part 2 we’re going to look at sports science and strength training and why you need to pay attention to your endothelial cells and their ability to produce nitric oxide. Sports Science and Strength Training! Sports science has come a long way in helping all levels of athletes improve their strength training. From teaching us the importance of developing your core muscles which provide a stable base for all your movements; to different strength training programs which improve muscle strength, tone, and endurance allowing you to stave off muscle fatigue and help to limit injury; to the importance of proper nutrition to both fuel and repair. Yet, there is still one factor that most leave out and that is the health of your endothelial cells and their ability to produce nitric oxide (NO). What Dr. Willoughby is pointing out is that nitric oxide plays a significant role in all phases of strength training. And, the organ of the body that is key to producing it is your endothelial cells that make up your endothelium. It is foundational to the cardiovascular system’s ability to deliver the necessary oxygen and nutrients needed for muscular contraction and relaxation. Additionally, that same cardiovascular system is needed to remove the waste products created during energy production so that the muscle and organ systems can work optimally or as close to optimally as possible. Many serious strength training athletes spend a lot of time, money, and effort on training, nutrition, and equipment. Equally important is spending time making sure your endothelial cells are properly repaired and supplied with the amino acids they need for improved nitric oxide production. Why Pay Attention to the Endothelial Cells and Nitric Oxide Production for Strength Training? As promised I’m going to open your eyes and mind to information that can take you to a whole n ew level of strength training. But first a little background. Your endothelium is a thin layer of cells that line the interior surface of your entire cardiovascular system including your heart. These cells are called the endothelial cells. When added up, the volume of these endothelial cells would cover the surface area of 8 tennis courts and weigh as much as the liver. That’s amazing since the endothelium is only one cell thick and can’t be seen by the human eye. Once thought to be just an inert membrane, research over the last 25 years has shown that the endothelium is an active, multi-functional organ that plays a vital role in metabolic, immunologic, and cardiovascular health. Most researchers today would tell you that your endothelial cells ultimately determine the health of your blood vessels. It’s these blood vessels that are delivering the needed oxygen and nutrients for your athletic performance as well as removing the waste products that help determine the speed of your recovery. All key to strength training. One critical function of the endothelial cells is facilitating the formation of new capillaries. While this is important in wound healing, it also plays a significant role in muscle creation and in the heart’s ability to develop collateral vessels to improve delivery of oxygen and nutrients. This collateral vessel formation is also key to improving your ability to fuel your muscles with oxygen and nutrients as well as effectively removing waste products. From airway relaxation for improved lung function to dilation of the blood vessels for improved delivery of oxygen and nutrients to the muscles, tissues, and organs, nitric oxide plays a critical role in strength training. In Part 3 we are going to examine how your endothelial cells and their ability to properly produce nitric oxide impacts your training, performance, and recovery in strength training. This final part will help you understand how you can experience substantial and significant improvements in your overall strength and fitness; but only if you nourish your endothelial cells properly. Together we can work to save a million lives! Dan Hammer has a background in biology, chemistry, and exercise physiology. He used to run one of the largest health club operations in the Chicagoland area and has been helping people with their wellness issues for more than 25 years. The information contained in this article is for general information purposes only and never as a substitute for professional medical advice or medical exam. The information about Strength Training contained in this article has not been evaluated by the Food and Drug Administration and should not be used to diagnose, treat, cure or prevent any disease without the supervision of a qualified medical doctor. Addressing the One Critical Factor That Makes ALL the Difference for Enhanced Strength Training – Part 1! I just recently wrote a very long article on strength training for another website and I thought I would share it with you. Why? Because it has a great deal to do with human performance since it centers on cardiovascular performance. Whether you are a competitive athlete or just living and breathing, your human performance and how well you function is highly dependent upon the one critical factor most people never pay attention to. That critical factor is the health of your endothelial cells and their ability to properly produce nitric oxide. “The field of strength training is both very broad and extremely dynamic. Broad because of the types of activities athletes engage in to improve their strength and conditioning. These activities could include general strength and conditioning programs for overall fitness to very unique and specific programs tailored to their particular sport. It could include resistance training, interval training, speed and agility training, plyometrics, injury prevention, and a wide range of other worthwhile methods to achieve the goal of increased muscular strength and endurance. The area of strength training is also extremely dynamic because science continues to unlock the complex association between biochemistry, nutrition, physiology, anatomy, and other scientific disciplines that can help to enhance athletic performance through improved strength training. Research and science that can be used to enhance general health and physical fitness as well as enhanced physical performance during athletic events. That’s a bold statement but if you continue to read the rest of this article you will see an area of anatomy, biochemistry, and nutrition seldom addressed in the textbooks written on strength training. Yet these three components have Nobel Prize winning science and cutting edge vascular research that hasn’t yet been properly applied to strength training. Whether you’re a recreational athlete or a professional athlete, this sound scientific information has resulted in clinical proof and application for improved cardiovascular health. It now has the potential to take your strength training program to a whole new level. One Common Element Found in Strength Training, Performance, and Recovery! However, when you look at these 3 components, central to everything is your cardiovascular system. While your heart is vitally important to this system it’s not the organ that will make the ultimate difference. That organ is the endothelium that lines all of your cardiovascular system including your heart! Most people in strength training have never even heard of this organ. One of the best books on strength training is Conditioning for Strength and Human Performance by T. Jeff Chandler and Lee E. Brown. In 476 pages of excellent information, with a specific chapter on “The Cardiorespiratory System”, there was not one mention of this organ. Even the Index has no listing for the endothelium. Yet this organ and the critical functions that it performs are central to the health of your cardiovascular system. It is the key component in your body’s ability to deliver needed oxygen and nutrients to fuel your muscles as well as effectively remove waste products that can limit your strength training workout and overall results. If you’re an athlete of any kind I’m going to help you understand how you can take your strength training program to a whole new level. In Part 2 I’ll explain some sports science and why you need to pay attention to the health of your endothelial cells and their ability to properly produce nitric oxide. Energy Production and Cardiovascular Health! I was going through some storage bins over the weekend and came across this crazy drawing of energy production you see on the left. It’s from my biochemistry class in college, and it has a direct application to cardiovascular health. In fact, once you understand it you will realize how important good circulation is to your health and your ability to produce energy. If You Had a Stock Option That Paid You a Return of 2% or 36% Which Would You Choose? Every person I’ve ever asked this question to always chooses 36%. Why? Because it returns a higher yield. Well, this is the difference in energy production between anaerobic respiration and aerobic respiration. Anaerobic Respiration – Energy Production Without Oxygen! The top half of this drawing represents the energy production achieved by anaerobic respiration. As your blood filters through the liver, glucose (blood sugar) is added to your blood stream. This is carried to your cells to be converted into energy. When your cell lacks oxygen it uses a chemical process called anaerobic respiration to convert the glucose into energy. It’s extremely inefficient and the net result is just 2 units of energy. Plus it produces a byproduct called pyruvic acid. If oxygen is not present then the cell converts this pyruvic acid to lactic acid. This allows the cell to continue to produce a small quantity of energy. However, lactic acid is an irritant. It causes that burning sensation you feel when you’ve overused a muscle and it interferes with proper cell function. The net result of anaerobic respiration is poor energy production and a large amount of waste material that disrupts the proper function of the cells, tissues, and organs. 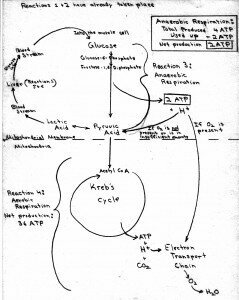 Aerobic Respiration – Energy Production With Oxygen! When oxygen is present the pyruvic acid will enter the mitochondria of your cells to be used in the Kreb’s cycle. (If you think this drawing is confusing and crazy you should see the drawing for the Kreb’s cycle.) Think of your mitochondria as an energy producing factory. This process will take that one unit of glucose and convert it into 36 units of energy. This is 18 times more productive than anaerobic respiration. Plus, the waste products are carbon dioxide and water. You breath out carbon dioxide and you eliminate any excess water. Neither of these two waste products damage your cells, tissues, and organs. While aerobic respiration can cause oxidative stress to cells, the net result is large energy production with waste material that is not disruptive to the proper functioning of your cells, tissues, and organs. Some have even compared this process of energy production to the difference between government run programs and private sector programs. Anaerobic respiration, like the government, is very inefficient and produces only a small return on investment; 1 unit of glucose yields 2 units of energy with bureaucratic red tape that can clog and slow down the system. Aerobic respiration, like the private sector, is very efficient and produces a large return on investment; 1 unit of glucose yields 36 units of energy with an assembly line that is highly productive but also needs proper maintenance to continue its accelerated production. What Does All This Have To Do With Cardiovascular Health? Your red blood cells carry oxygen to your tissues and cells. If your cardiovascular system is damaged by cholesterol, excess sugar that causes oxidative stress, plaque formations, and other contributing factors, then you begin to limit blood flow. This damage limits the delivery of oxygen and causes your cells to depend more on anaerobic respiration for their energy needs. Because anaerobic respiration can’t keep up with the needs of the cells, the cells have to slow down. They become less efficient and sluggish in their job. Compound this with the waste products produced from anaerobic respiration and you have a cycle that leads to poor organ health and poor overall wellness. The Key to Reversing This Cycle! The key to reversing this degenerating cycle is to improve blood circulation by repairing the damage caused to the endothelial cells that line all of your cardiovascular system. As you improve the health of your endothelial cells they are able to properly produce nitric oxide. Nitric oxide is the master signaling molecule of the cardiovascular system. This means that nitric oxide is needed to properly regulate blood flow to the cells, tissues, and organs. This dramatically improves blood flow, which then delivers more oxygen. More oxygen produces more energy and waste products that are easily transported away from the cells, tissues, and organs. The net result is improved organ function, improved energy, and a higher level of overall wellness. By properly combining the amino acids L-arginine and L-citrulline with key antioxidants you can repair your endothelial cells and improve their ability to create nitric oxide. This has been clinically shown to improve circulation and reverse many cardiovascular health issues. It’s what makes the ProArgi-9 Plus product so effective in helping people improve their energy production and cardiovascular health. It’s pretty amazing how improved blood flow to all your cells, tissues, and organs can make such a significant difference in your overall health. But, there is still one other factor we need to address. That factor is the need for antioxidants to help protect your cells when oxygen is used to create all this wonderful energy. We’ll talk about this in my next post. Dan Hammer is a Wellness Educator who has a background in biology, chemistry and exercise physiology. He used to run one of the largest health club operations in the Chicago area and has been helping people with their wellness issues for more than 25 years. The information contained in this article is for general information purposes only and never as a substitute for professional medical advice or medical exam. The information contained in this article about energy production and cardiovascular health has not been evaluated by the Food and Drug Administration and should not be used to diagnose, treat, cure or prevent any disease without the supervision of a qualified medical doctor. Can Heart Attacks Be Prevented? When I wrote the title for this post I immediately thought of my father who passed away in 1987 of a massive heart attack. He died while on a fishing trip in Minnesota. He was sitting in the cabin with his friends eating his favorite snack. Popcorn loaded with butter. He died at the young age of 67. Like his father who died of a heart attack and his mom who died of a heart attack, he followed their pathway. Was it genetics and heredity that caused this event? Or, was it lifestyle and food choices? Most likely a combination of both with a greater emphasis on food choices. Can a Heart Attack Be Prevented? While the question remains the same the outcome can be significantly different! Eleven years after my father’s death from a heart attack the 1998 Nobel Prize in Medicine was awarded to three American researchers for their remarkable discovery of how the endothelial cells, which line all of your cardiovascular system, create nitric oxide. Nitric oxide is the master signaling molecule of the cardiovascular system and it has a huge impact on cardiovascular health. Even before Dr. Ignarro’s Nobel Prize there was an event taking place that has significantly moved the discoveries made in the lab to practical clinical results in humans. Let me introduce you to Dr. J. Joseph Prendergast or Dr. Joe as he prefers to call himself. Dr. Joe is a leading endocrinologist from Palo Alto, CA and a nationally acclaimed expert on L-arginine therapy. L-arginine is the amino acid your endothelial cells use to create nitric oxide, the master signaling molecule of your cardiovascular system. Since 1991, Dr. Joe has been personally using L-arginine and recommending it to his patients. Through his close personal association with Dr. John Cooke at the Stanford School of Medicine’s Cardiovascular Research Center, Dr. Joe has been able to incorporate cutting edge vascular research done in the lab into actual patient care. True clinical application that has benefited thousands of his patients and tens of thousands of people around the world. Dr. Joe’s clinical application of proper L-arginine therapy has benefited over 7,000 of his own patients resulting in less than 1% patient hospital admissions in 17 years. This is a phenomenal record especially then you realize that 80% of his patients are diabetics who typically have hospital admissions for cardiovascular issues. Because of this remarkable record the American Diabetes Association awarded Dr. Joe the Father of the Year Award in 2008. Would My Dad’s Heart Attack Have Been Prevented If He Had Access to ProArgi-9 Plus? From all the clinical research I’ve seen and the people I’ve been able to help, I believe he would have greatly benefited from this product. It’s one of the reasons why I’m so passionate about ProArgi-9 Plus. I truly believe in this product and its ability to improve the cardiovascular health of every person. Now you can understand why I believe so strongly in ProArgi-9 Plus. It is a remarkable product that has huge potential to benefit people. Especially those who have cardiovascular health issues. Dan Hammer has a background in biology, chemistry and exercise physiology. He used to run one of the largest health club operations in the Chicagoland area and has been helping people with their wellness issues for more than 25 years. The information contained in this article is for general information purposes only and never as a substitute for professional medical advice or medical exam. The information contained in this article about heart attack prevention has not been evaluated by the Food and Drug Administration and should not be used to diagnose, treat, cure or prevent any disease without the supervision of a qualified medical doctor. Food versus Supplementation for L-Arginine and L-Citrulline! In my last post I showed you the amount of food you would need to consume to take in 5 grams of L-arginine, 1 gram of L-citrulline, and 400 micrograms of folic acid. Three key nutrients for cardiovascular health. L-Citrulline through food or supplementation? Observation 1 – As you saw from the video there is a strong case for proper supplementation especially when you factor in calories, cost, and convenience. The cheapest meal you could consume was 12 ounces of black beans, 2.7 pounds of watermelon and 1 cup of Total cereal at a cost of $4.45. This meal would also bring 813 calories into your body. Observation 2 – Instead of conventional food you had two other choices. Your first choice would be to go to your local health food store and purchase three supplements: L-Arginine, L-Citrulline and Folic Acid. While this is the least expensive way at $1.86 it also means taking 13 capsules per day. You would need to take 1 Folic Acid tablet, 2 L-Citrulline capsules, and 10 L-Arginine capsules. Just remember, if you choose supplementation then make sure that you only use the natural “L” form of the amino acid and never the “D” or synthetic form. Additionally, make sure that the product uses “pharmaceutical grade” ingredients. This ensures that the ingredients meet exacting standards so that product quality and consistency is maintained from batch to batch. This is especially important for L-arginine products. There are a lot of “nitric oxide” products in the marketplace. They are widely used by weight lifters to help them experience improved workouts and increased muscle mass. But, “nitric oxide” products are not to be played around with. It’s extremely important to know who the product formulator is and what experience they have in properly isolating L-arginine so that it can be effectively brought into your system. It’s also important to know if the product you’re considering has any clinical studies associated with it. Clinical studies that can support its effectiveness in truly improving the health of your endothelial cells so that they can properly produce higher levels of nitric oxide. Observation 3 – As you know I’m a firm believer in ProArgi-9 Plus. It’s your other choice. While it’s slightly more than the supplements, it does provide you with 9 additional ingredients all designed to help improve cardiovascular health. When compared to the food choices, it is $2.00 cheaper and significantly lower in calories. This allows me to properly support my cardiovascular system, especially my endothelial cells. It also allows me more flexibility in my diet for other healthy organic foods. While there are a handful of other good products in the marketplace, none have the clinical studies to support their effectiveness like ProArgi-9 Plus. Observation 4 – I made a pitch for eating organic foods at the end of the video. While organic foods are certainly higher in cost than the store bought brands it’s worth the extra expense in helping improve liver function. As I shared in the video, every added “chemical ingredient” has to be processed by your liver, which takes away its ability to help your body in other needed areas. If you want to have your eyes opened to the food industry and how they manufacturer our food sources, then rent the DVD Food Inc. from your favorite rental source. Well, I hope this video and post has been educational and beneficial in helping you see proper supplementation as a complement to making good food choices. The information contained in this article is for general information purposes only and never as a substitute for professional medical advice or medical exam. The information contained in this article about L-Arginine and L-Citrulline has not been evaluated by the Food and Drug Administration and should not be used to diagnose, treat, cure or prevent any disease without the supervision of a qualified medical doctor. I’ve been asked by many of my clients and visitors to this website to put together a short video on ProArgi-9 Plus instructions. I’ve just completed this video. In it I go into detail on how to take this unique and remarkable product. A product designed to help repair the endothelial cells of your cardiovascular system; to improve their ability to properly produce nitric oxide over a long period of time. If you remember from previous posts, nitric oxide is the master signaling molecule of the cardiovascular system. Additionally, nitric oxide is critical to other very important biological functions. How much ProArgi-9 Plus should you take? When is the best time of day to take ProArgi-9 Plus? Mornings? Afternoon? Before you go to bed? Can you take ProArgi-9 Plus with food? Can athletes use ProArgi-9 Plus? Does ProArgi-9 Plus interfere with medications? I hope this video was helpful in understanding how to take ProArgi-9 Plus. Please feel free to share this information with family and friends. If you’re interested in ordering ProArgi-9 Plus then please click on “Quick Order Page for ProArgi-9 Plus.” Once on the page I would ask you to “Bookmark” it so that you can conveniently return to it whenever you need to. I will try to provide you and your health care provider with the information you need to make the best decision for you. Our goal is to help as many people as possible see significant improvements in their cardiovascular system so that they can enjoy a higher quality of life. The information contained in this article is for general information purposes only and never as a substitute for professional medical advice or medical exam. The information contained in this article about ProArgi-9 Plus has not been evaluated by the Food and Drug Administration and should not be used to diagnose, treat, cure or prevent any disease without the supervision of a qualified medical doctor. 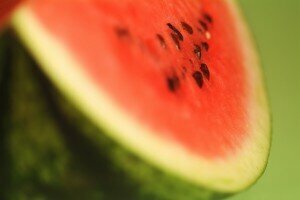 What’s a picture of a watermelon have to do with L-citrulline? I’ll answer that in a little bit. Let’s first start with nitric oxide and L-arginine. So much of the buzz about improved nitric oxide production centers on L-arginine. Unfortunately, many forget about L-citrulline. While L-arginine is the main amino acid used by the endothelial cells to create nitric oxide, some feel that L-citrulline is actually more important for long term nitric oxide production and improved cardiovascular health. I bring this to your attention because I’m in the process of developing an educational module designed to help those with sickle cell anemia. One complication for those who have sickle cell anemia is the negative effects of the enzyme arginase. Arginase is an enzyme located primarily in the liver. It is used to help complete the fifth and final step in the urea cycle. This urea cycle helps your body dispose of harmful ammonia. It is also found in the kidneys and prostate. Some research indicates that arginase is located in the mitochondria of most cells. The mitochondria are the portions of your cells that produce the bulk of your energy. While arginase has a useful role in the body it can also play a negative role in circulation. Why? Because arginase destroys L-arginine. Your endothelial cells convert the amino acid L-arginine to nitric oxide. Nitric oxide is the master signaling molecule of your cardiovascular system. It regulates blood pressure, helps to improve blood flow, keeps blood platelet cells from sticking together, prevents LDL cholesterol from adhering to the vascular walls and is a factor in a host of other very important health issues. Everyone carries arginase in their bloodstream which can have some affect on lowering nitric oxide production. This is a bigger problem in the African American community especially for those with sickle cell disease. Thankfully, your body has an alternative pathway that enables the endothelial cells to create nitric oxide. It’s through the amino acid L-citrulline. Your endothelial cells use an alternative pathway to convert L-citrulline to nitric oxide. This helps bypass the arginase enzyme so that good nitric oxide production can be restored. Plus, L-citrulline provides a 24 to 36 hour window for enhanced nitric oxide production whereas L-arginine by itself usually only has a 30 minute to 2 hour window of enhanced nitric oxide production. This means that L-arginine can help start the process of nitric oxide production to improve circulation. Then the L-citrulline can take over to continue the improved nitric oxide production helping to maintain improved circulation. What foods contain L-arginine and L-citrulline? Is it better to get these critical amino acids through food or supplementation? I’m preparing two new videos to help answers these questions and to visibly show you the best and most effective method for enhanced nitric oxide production. But the first question brings me back to the picture of the watermelon. In March of 2007 there was a study published in the Journal of Nutrition. The article was entitled “Watermelon consumption increases plasma arginine concentrations in adults.” This article created a significant buzz on the internet because L-arginine is needed to produce nitric oxide which is needed for a male erection. In the media, watermelon became the new and natural Viagra. While this study didn’t examine the effects on male anatomy it did provide some very important information confirming the body’s ability to convert L-citrulline to L-arginine to improve nitric oxide production. The study subjects were given either 780 grams (equivalent of 1 g of citrulline) of watermelon or 1560 grams (equivalent of 2 g of citrulline) of watermelon. The study lasted three weeks. At the end of the study the 780 grams of watermelon group saw a 12% increase in fasting plasma arginine concentrations. The 1560 grams of watermelon group saw a 22% increase when compared to a control group that received no watermelon. This clearly shows that your body has an alternative pathway for creating the necessary L-arginine from the amino acid L-citrulline. So, is eating watermelon an effective way to improve nitric oxide production? Well, the 780 grams of watermelon is equal to 1.72 pounds. The 1560 grams of watermelon is equal to 3.43 pounds. That’s a lot of watermelon to eat even if you like it. Plus, it includes the rind, that thick green outer covering of the watermelon. I believe there’s an easier way to achieve an even better result. I’ll show you in one of my upcoming videos. The information contained in this article is for general information purposes only and never as a substitute for professional medical advice or medical exam. The information contained in this article about L-Citrulline has not been evaluated by the Food and Drug Administration and should not be used to diagnose, treat, cure or prevent any disease without the supervision of a qualified medical doctor. Quick Order Page for ProArgi-9 Plus! I’d like you to know about the new Quick Order Page for ProArgi-9 Plus. This page provides one central location to order this “remarkable” and unique product. It’s available to my existing customers and to those considering ProArgi-9 Plus. This short video tutorial will show you how to quickly and effectively use this page. ProArgi-9 Plus is the nutritional supplement at the heart of the High Desert Heart Institute study. This study has had a profound impact on the method of treatment for the patients at the High Desert Heart Institute. Additionally, if you watched the video you know that we are close to releasing our first information module “Help with Pain from Sickle Cell Anemia!” Our goal is to have this information platform up on the internet sometime between March 31st and April 15th. When it becomes live we will announce it here and provide you with a link to this platform. Our next information module will be “Help with Complications from Diabetes!” We hope to have this one completed by the end of May. Please feel free to share the information with family and friends. At one time heart disease was the number one fear of most people. 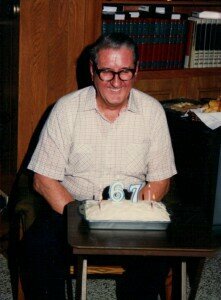 Then came cancer and today most people would identify Alzheimer’s disease as their number one fear. Yet as these different diseases have had a significant impact on the health of our nation, heart disease is still the number one cause of death for both men and women. To help you understand both the severity of heart disease, and the potential for a remarkable reversal to the devastating effects of this disease, my two friends Paul Conterio and Richard Logsdon have developed a professional audio/visual presentation. This presentation is broken down into three parts. Just click on each image for that video section to play! In 5 minutes and 21 seconds this video will show you the sobering impact that cardiovascular disease has and continues to have on the health of both men and women. We all remember September 11, 2001 when terrorists killed 2,974 innocent men, women, and children. This act brought our nation to a standstill. It impacted the United States and the World in general. Yet, everyday is a 9/11 in America because approximately 2,500 people die of heart disease each and every day. The terrorist is cardiovascular disease. Loved ones and families are brought to a standstill and the impact is felt through out our communities. This video will help you realize that heart disease is 12 times more deadly to women than breast cancer; and more deadly in one year than the combined total of all deaths from all the wars America has fought in. Watch this video to understand the scope of this deadly problem in America and world wide. So what’s the answer to stopping cardiovascular disease and its deadly effects on men and women? Part 2 presents a direct answer to this threat. In fact, the answer won a Nobel Prize. 1901 – Wilhelm Conrad Rontgen for the discovery of X-rays! 1923 – Frederick Banting and John Macleod for the discovery of insulin! 1945 – Sir Alexander Fleming, Ernst Boris Chain and Sir Howard Walter Florey for the discovery of penicillin! 1998 – Robert F. Furchgott, Louis J. Ignarro and Ferid Murad for their discoveries concerning nitric oxide as a signaling molecule in the cardiovascular system! Most people have had an x-ray taken at some time in their life. If you’re a diabetic than you understand how critical insulin is to your health. And, at some point in time, you most likely received penicillin to keep an infection in check or eliminated it completely. However, most people have never heard of Nitric Oxide yet it has the power to prevent cardiovascular disease and do it without drugs or surgery. Watch this video and see why Dr. Louis J. Ignarro’s book entitled NO More Heart Disease is a national bestseller. This video will show you how your body’s endothelial cells, which line your blood vessels, can be your lifesaver from heart disease. Your body has approximately 100,000 miles of blood vessels. The proper understanding of their health, especially the health of your endothelial cells, is critical to the prevention of heart disease. Central to this whole process is your body’s ability to produce Nitric Oxide which is regulated by the endothelial cells. The amino acid L-arginine is the source your endothelial cells use to create nitric oxide. How effective is L-arginine and nitric oxide in preventing heart and cardiovascular disease? Dr. J. Joseph Prendergast is on the cutting edge of this combination. The results, especially for his large patient population of diabetics, are nothing short of miraculous. Watch this video to learn how Dr. Prendergast has virtually eliminated the need for cardiovascular surgery in his practice. This blog is designed to educate you and provide you with cutting edge information that can have a significant impact on your cardiovascular health. Dr. Ignarro’s book NO More Heart Disease is available thru Amazon.com. 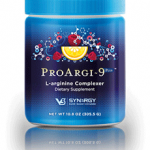 Dr. Prendergast formulated ProArgi-9 Plus and I’ve provided a link to give you more information about this product. These are resources that can make a positive difference in the health of your cardiovascular system. They are resources that can save lives. I hope you’ve enjoyed the three videos above and will share them with others. The information contained in this blog is for general information purposes only and never as a substitute for professional medical advice or medical exam. The information contain in this blogging website has not been evaluated by the Food and Drug Administration and should not be used to diagnose, treat, cure or prevent any disease without the supervision of a qualified medical doctor.